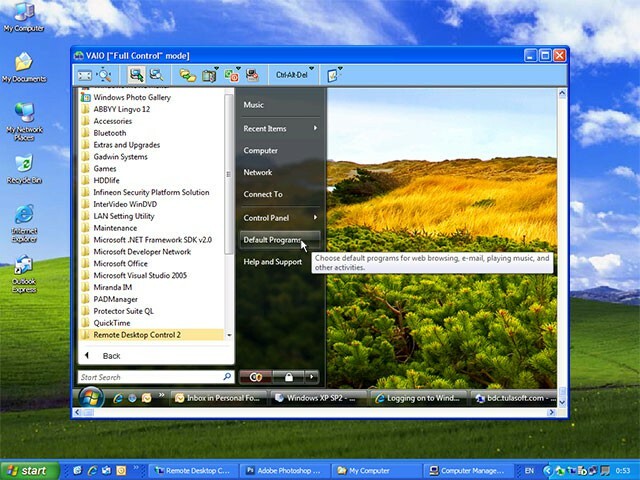 Remote Desktop Control 1.9 is remote computing software developed by AQUATRA. Remote Desktop Control allows you to control any remote computer from another computer. Such task is no longer just for network administrators, now you can have the same control. Imagine, you can work on your office computer right from your home computer without leaving the house! You won't even have to leave your cozy chair :) Try Remote Desktop Control and you will gain incredible mobility and save time too! This network & internet software is shareware, which means you can download and use Remote Desktop Control 1.9 for free during the trial period (usually for 30 days). At the expiration of the period you will have to buy the remote computing product for $15.00. Remote Desktop Control 1.9 is available at regnow and AQUATRA website. Remote Desktop Control 1.9 supports different languages (including English, German, Russian, French, Spanish). It works with Windows 98/XP/Vista. We have tested Remote Desktop Control 1.9 for spyware and adware modules. The software is absolutely safe to install. Our website has thoroughly tested network & internet product Remote Desktop Control 1.9, written the review and uploaded installation file (1353K) to our fast server. Downloading Remote Desktop Control 1.9 will take minute if you use fast ADSL connection. Secure remote desktop access and sharing large files via LAN or Internet.